The one exception was Anchorage, Alaska. After much research and checking with friends whose house we were looking after it was determined city exploring by transit just wasn’t viable. And we were correct. Perhaps our biggest public transit challenge was exploring Las Vegas. We were told we couldn’t/shouldn’t do it. But, we were bound and determined to use the RTC (Region Transportation Commission of Southern Nevada) even though we were staying on the “tourist trap” strip. We researched the transit system and found they had a four-day transit pass for $15 – perfect! However, upon arriving, we found out that it was for locals only. A bit of a disappointment, but not giving up, we took a short walk off the strip to a local convenience store where we scored two, 4-day passes. While the service wasn’t very frequent, we were able to get to our off-the-beaten path destinations like the Neon Boneyard and various thrift stores. Lesson Leaned: Souvenirs sometimes come from unexpected places. Las Vegas' Boneyard Museum is where all the mid-century neon signs are stored. Gradually they are being restored and place along major roads in the city. It is a wonderful place to explore, a photographers paradise. Tattoo Parlour in San Diego. We often find that tattoo parlours have some of the funkiest store fronts. One of the great things about using transit is the opportunity to interact with the locals. Probably our most memorable “transit tale” was what happened in San Diego. Again, we had four-day passes (a bit harder to get than we expected), but while waiting in line, we stuck up a conversation which resulted valuable information from locals, including catching the bus just outside the transit shop door, and go to a great night market in 30 minutes. Even luckier for us, the bus we needed was out front when we stepped out of the transit shop. Two locals, on the bus not only told us what stop to get off at, but what specific vendors and shops we should check out, which proved to be very accurate. Lesson learned: Don’t be afraid to ask locals for tips on what to see and do. You will often learn things that aren’t in the tourist propaganda – a new café, where the good muffins for breakfast are or where the best happy hour is. One of our funniest transit tales happened on the way home from the San Diego night market. At about 9 pm, we got on an empty bus which soon filled up with a cast of characters including four, lively teenage girls who were bouncing from seat to seat. I asked them if they were playing “musical chairs.” They smiled and said nothing. At the next stop, I moved to another seat and they quickly did too. For about 10 stops, we did this, much to the amusement of the other transit riders. At their final stop, they waved goodbye and we wished them a good evening. Who knew riding the bus could be so entertaining! Lesson learned: Don’t judge a person by their tattoos. But perhaps our most fun-filled transit tourist day ever was in San Francisco. We signed up for the Real San Francisco Tour by Chris Courtney (technically this was an organized tour which we rarely do, but this tour is so personal and “insider,” it is in a league of its own). This all-day trek takes you through 11 of the city’s coolest neighborhoods via cable cars, city buses, light-rail and subway transit. It includes stops at secret spots - fortune cookie-making bakery, OJ Simpson’s high school, back alley gardens and unique views of Alcatraz, Fisherman’s Wharf, painted ladies and the Golden Gate Bridge. The tour includes over five miles of walking, four separate uphill sections as well as six uphill and fifteen downhill flights of stairs. But it was totally worth it to get the “inside scoop” on SF’s past and the present. We would never have found some of the places on our own, despite priding ourselves on “digging deep” with our online research. The Real SF Tour offers many unique and quirky experiences including this behind-the-scene tour of a fortune cookie bakery. There is no way we could have found this on our own. Hopping on the street car to start the real SF tour. Who knew transit could be so much fun...every city should have a street car/trolley route. One of the many interesting vistas along the Real SF tour - that is Alcatraz in the distance. Then there was the “early morning massage on the crowded Vancouver bus” story. Minding our own business, with me sitting directly Brenda, I jokingly started to give her a shoulder neck rub. Just then a very tiny older Asian woman told me I was doing it wrong and proceeded to give me a hands-on lesson right then and there. You just never know what is going to happen when you get on transit. Lesson learned: Enjoy the journey as much as the destination. You never know what you might see when riding the bus in Vancouver. I captured this image while the bus was waiting at the traffic lights along Commercial Drive. At first was taken aback but then realized they were filming a movie. These are the kind of impromptu "street surprises" that we enjoy as transit tourists. As for one of our most epic bus trips, it was when in Guadalajara, Mexico when we got on the wrong bus and found out we were heading to Ajijic and Lake Chapala (can’t remember the town we were planning to visit). Once we realized we were on the wrong bus, we decided to just “go with it.” Turned out to be one of the best “treasure hunting” days of our lives. Arriving in Ajijic, we found a wonderful resort town on the shore of the largest lake in Mexico at the same latitude as Hawaii. It was full of expats from Canada and US who have wintered here since the mid-‘50s. It is also famous for being the home of D.H. Lawrence After wandering the downtown for a bit with its charming town square, we found a spot to have lunch and quickly started up a conversation with two snowbird couples at an adjacent table who drive down from southern Ontario every winter. After lunch, we wandered further afield and stumbled upon Bazar Barbara’s a flea market/used-furniture emporium. Brenda the scavenger she is, unearthed behind a pile of old frames a framed Mariam Shapiro 1961 drawing with a Andre Emmerich Gallery, New York City sticker on the back for $25. We knew we had a great find – and so began our “Wall of Thrift.” We also found an authentic Asian gong for 10 bucks, which we hauled home and now holds pride of place in our garden. It was a perfect day! Lesson Learned: Don’t be afraid of getting on the wrong bus. It might just end up being the best decision you make that day. Bazar Barbara in Ajijic Mexico was a great place to explore and was probably the catalyst for us to begin our 'found" artwork collection. 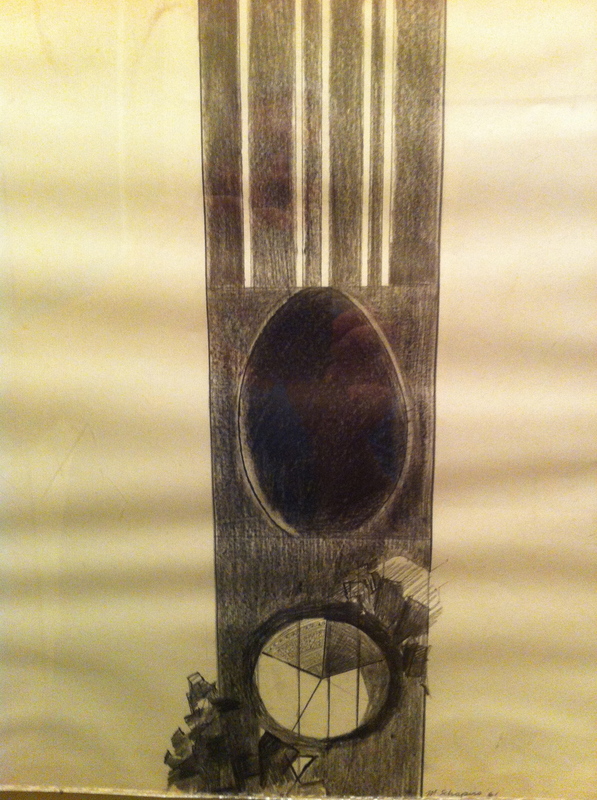 "Yesterday" by Miriam Shapiro a 13.5 by 15 inches pencil drawing was our big find at Bazar Barbara's. It is a bit wrinkled but otherwise in great shape. The gong acquired at Bazar Barbara's in our garden. Some of the artworks collected over the years have been collaged into a "wall of thrift." You see more when someone else does the driving. We enjoy the bus more than subway as you get to see things along the way. It allows you rest a bit and most buses today are air conditioned so you can cool off a bit too. You don’t have to search for a parking spot. We’d love to hear your “transit tales.” We will add them to this blog.